Sift together, potato starch, cornstarch and granulated sugar. Set aside. In a large mixing bowl, combine egg whites, salt, cream of tartar and extracts. Beat on high speed with electric mixer until stiff peaks form. Do not over beat. Reduce the speed to medium-high and sprinkle in the remaining cup of sugar. Beat 2 minutes. Turn mixer to lowest speed and sprinkle in the sifted starch-sugar mixture, beating about 1 minute more. Carefully pour out the mixture into an un-greased 10” tube pan. Bake 35 minutes. Invert pan and let cool completely. I got mine at the bulk food store, Asian groceries will have it as should anywhere stocking Kosher items. I've never heard of potato starch, where can I buy it? 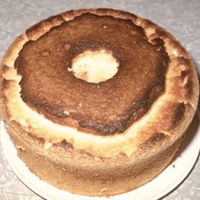 I am so excited to try this, it's so hard to find recipes for angelfood cake! thanks, my poor GF wife has had a hankering for a nice cake...you've supplied one...thanks so much.